Not exactly elbow macaroni: fregula sarda, a Sardinian specialty, is one of the beautiful artisan pastas from Italy that can make your repast special with very little effort. KAREN HOCHMAN is Editorial Director of THE NIBBLE™. CAPSULE REPORT: Great artisanal pasta-makers are alive and well in Italy. Making pasta with delicious durum and waters from fresh streams, hundreds of shapes are available that offer the home cook the ability to put edible art on a plate. With all due respect to a good plate of angel hair, there’s nothing better than discovering a new shape—and deciding the best way to work with it—to add excitement to the dinner table. There are hundreds of different shapes of pasta in Italy: each region developed its own. In a land of passionate food artists, the time and patience given to developing the next beautiful shape was enormous, in the days before electricity and running water, when everything was painstakingly done by hand. While certainly, large pasta makers like Barilla are the biggest sellers in Italy, the country maintains its small artisan firms, where people who are still committed to the artistry of their ancestors practice the highest level of culinary arts. Some of those products never leave the country; others are sourced—fortunately for us—by American importers whose passion for thee delicious foods are as great as the people who make them. Pasta is such a simple product: flour and water kneaded into a dough. What makes Italian pasta so much better...and what makes the great artisanal pastas of Italy the best? The secret of great pasta is to use the finest quality ingredients and adhere to meticulous techniques. But everyone claims they use “the finest quality ingredients”: what does this really mean? Wheat. 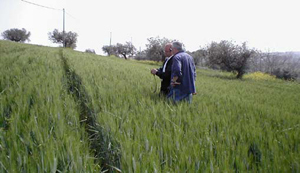 It starts with the selection of the durum wheat: Just as there are different qualities of everything that grows, from coffee to oranges, there is durum and there is durum. The best wheat is is stone-ground into semolina, then mixed with water from a fresh supply—very often mountain water, since many artisan pasta companies are located in rural hill areas, not in large cities using a municipal water supply. Examining the durum to be used for Rustichella d’Abruzzo pasta. Water. Does the quality of the water matter? Absolutely! Hard water versus soft water creates a totally different product. Even with a low-pH water, the particular mineral profile of the water affects the taste (read more about this in our Bottled Waters Section). That’s why New York City bagel-makers and pizza-makers say they can’t replicate the product of their dough elsewhere! Bronze Dies and Slow Air-Drying. The dough is then extruded through hand-carved, 19th century bronze dies, and air-dried for 40 to 60 hours at a low temperature (35°C), depending on the shape. Compare that to three hours of hot-air drying for commercial pastas! The old bronze dies give the pasta a more coarse surface, which helps it to better grab onto sauces and provide a better “chew”: Place a bowl of commercial fettuccine side-by-side with an artisanal fettuccine and you can immediately see the difference in the appearance, and then the mouthfeel. The low drying temperature also preserves the nutritional value of the pasta, and during the long drying period a fermentation process takes place which imparts a special taste to the pasta. Thus, even if a large commercial producer starts with the same excellent wheat and uses the same water, it won’t produce the same fine product as a artisanal producer. The result of all of this attention to detail is pasta with a superior flavor and texture. That’s why Italians use so little sauce: because their pasta is so flavorful. While this article focuses on unusual shapes, artisanal pasta makes just as big a difference in everyday penne, linguine and shells. One of the easiest ways to put something special on the dinner table is to visit the pasta section of your favorite specialty food store and find a beautiful new cut. We show just four hear, but look at our Pasta Glossary for many more ideas. Literally, “small rings,” tiny rings of pasta for soup. Add them to a clear broth—chicken or seafood. You can add a shrimp or mussel and a snow pea for a Japanese effect, or stick with the Italian theme and add a slice of chicken, fresh basil and a rosemary sprig. These rings are made by Rustichella d’Abruzzo, a fine artisan producer that makes regional pasta shapes of Abruzzo and beyond—a beautiful rendition of Sardinian fregula, that we feature below, for example. Anellini, small rings, are meant for soup. 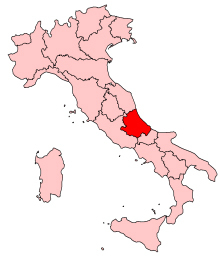 This specialty retailer carries many of the standard cuts and specialty products of Rustichella d’Abruzzo. While you’re on the website, be sure to look at the Cannolicchi, a coiled, ridged tube shaped like a rare clam from the Adriatic Sea (which Abruzzo borders); the fun white Calamarato and black Calamarato Nero di Seppia (made black with squid ink), pasta rings shaped like calamari that are wonderful delicious with seafood sauces; the curving, twisted Cassareccia; the gorgeous Fusilli col Buco, a very long corkscrew spaghetti with a hole in the center; black squid ink spaghetti, and extra-long spaghetti—over 36 inches! For more information about the manufacturer, visit Rustichello.it. The traditional coin pasta of Liguria is a curiosity—something to try at least once. During the feudal period, powerful clans displayed their coats-of-arms for status, even at the dinner table. Now Croxetti made by La Bella Angiolina in the town of Albenga are imprinted with sunsets, palm trees, and other designs. Each piece is still individually hand-stamped (they used to be made in the homes of the local peasants). As charming as they look, the challenge is that they are flat disks—not easy to pick up with a fork, and not quite as endearing when cooked up and sauced as they are in the bag. Still, we like the symbolism: the pot of gold at the end of the rainbow, Chanukah gelt, the big raise.... Traditionally they are serve with a basil or walnut pesto, but you may come up with a new, clever way to serve them. 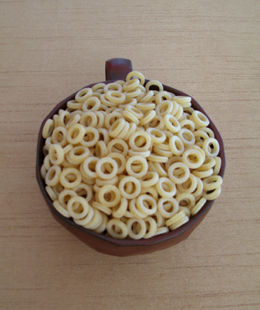 Croxetti, the traditional coin pasta of Liguria. Our current favorite presentation is to place individual croxetti around the perimeter of a large plate with a piece of grilled fish in the center; we top the fish with some salmon or whitefish caviar for a “wealth and caviar” theme. If you want an alternative to the pesto, try serving with a lime or yuzu vinaigrette or other light sauce. 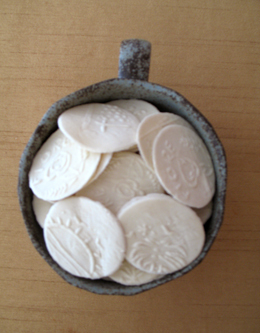 Alte Valle Scrivia is a pasta maker in the hills above Genoa that makes a more traditional coat-of-arms coin. A small, toasted semolina pasta that resembles couscous, fregula is rolled into balls and toasted until it turns a deep, golden hue. 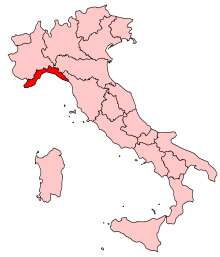 It was part of the Moorish cuisine of North Africa that came to Sardinia and was imported elsewhere by Ligurian sailors (pasta, in the form of spaghetti, initially came to Italy via the Arab invasions of Sicily in the ninth century). 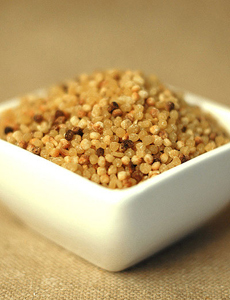 Serve fregula in soups, as a cold pasta salad or as a side dish with grilled meats or fish. You can make a delicious recipe, Sa Fregula con Vongole, a traditional Sardinian soup of fregula and clams in a saffron broth. 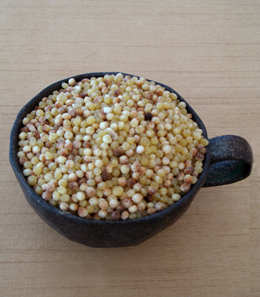 Fregula, from Rustichella d’Abruzzo, a traditional pasta of Sardinia. Made from stone ground durum flour from hard winter wheat and pure spring water, Rustichella d’Abruzzo’s fregula is the most beautiful we’ve seen: Some of the balls are rosy-colored, and we could keep our cup as a still life. The Rustichella d’Abruzzo fregula can be purchased at MarketHallFoods.com. We’ve also had delicious Fregula Sarda from GourmetSardinia.com. Another Sardinian specialty, these half-inch-long ridged pastas that look a like small worms. They also are known on the island as gnocchi, though they are nothing like actual gnocchi dumpling-type pasta. We think they’re much better—this is one of our favorite pasta shapes, and not because they look like worms. We love the chewy mouthfeel, and if you don’t tell people they’re supposed to be worms, many might just admire the pretty ridged shape. The ridged pasta is actually teardrop-shaped, then the edges are rolled together. 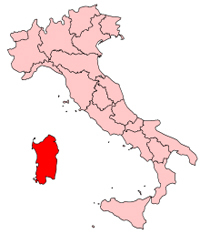 Malloreddus is staple of the Sardinian kitchen, generally served as a first course. with a hearty tomato and meat sauce (lamb, beef or sausage). You can enjoy them more simply, with extra virgin olive oil and grated bottarga, Sardinian-style; or with grated cheese. 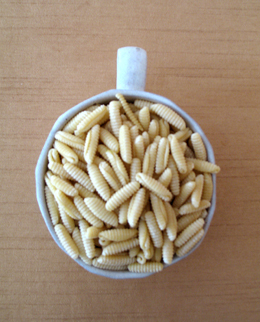 Malloreddus, a Sardinian pasta specialty.